Avocados first arrived in Australia in 1840 in seed form, and were planted in the Royal Botanical Gardens in Sydney. Further commercial imports of seed and plants continued over the next 110 years until by the late 1960’s when a developing Australian industry began to take shape. Currently avocado orchards are found in Queensland, New South Wales, South Australia, Victoria, Western Australia and Tasmania. Avocados are a perennial fruit and Australian premium produce is available all year round because of the widespread and climatically diverse growing regions. The highest volume of fruit is available between March and November. Avocados are known to have existed from as far back as 291 BC. They originally took root in the highlands of Central America and Mexico and the lowlands of Columbia in South America, where they grew wild. This exotic fruit was first transported to Europe in the 16th century, after the Spanish conquistadors invaded Mexico and Peru. When the Aztecs discovered the unique greenish coloured fruit with a seed in the centre they dubbed it ‘ahuacatl’, which has evolved over the centuries into the word avocado. 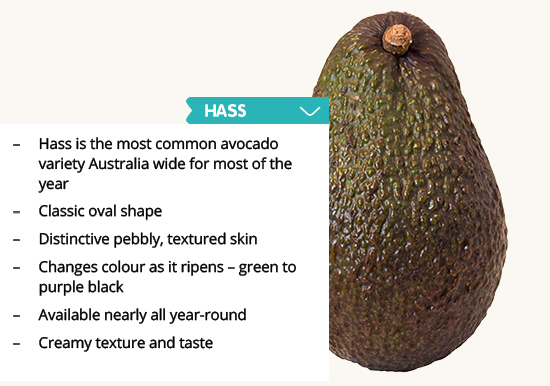 The two main varieties of avocados grown in Australia are Hass and Shepard. Hass are in season from May through to January and Shepard’s are in season from February through to May. We recommend storing your avocado at room temperature in the fruit bowl until it reaches the preferred ripeness for eating. To speed up the avocado ripening process we recommend placing unripe avocados in a brown paper bag with an apple or banana for two to three days until they are ripe. It’s the plant hormone ethylene, which occurs naturally in fruits like apples and bananas, that triggers the ripening process. Refrigerating a whole, ripe avocado will maintain the optimum ripeness for two to three days until you are ready to use it. Sprinkle cut avocado with lemon juice or vinegar to stop it browning, seal with cling wrap removing any air, and store in fridge. Pick the perfect Hass avocado every time by following these simple steps. With their green skin, pick the perfect Shepard every time by following these simple steps. Sliced, diced, chopped or smashed, avocados make everything better. 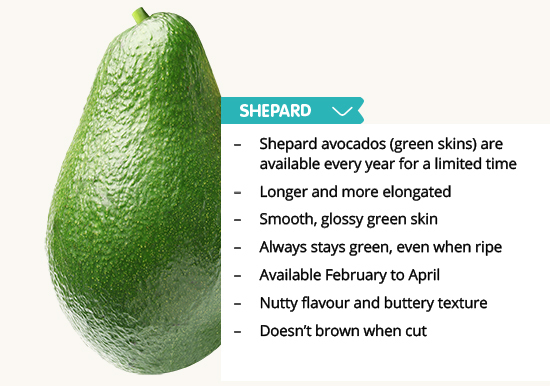 Learn how to make your meal better while Shepard avocados are in season.